GAIA uses the following fabrics for jerseys, shorts, warm ups and training pieces. The below table indicates which fabric is available for a certain collection of our most popular items, the Jerseys and Shorts. 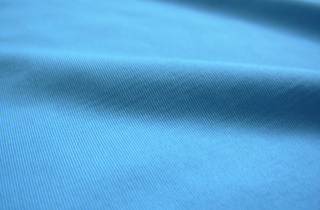 If you are looking for an ultra breathable and thin fabric for hot summer play, FLYweight is your fabric of choice. FLOtech - FLYweight: is one of the lightest, best wicking, most breathable, almost indestructible and therefore the most highly coveted team jersey fabrics in Ultimate. We didn't offer it for a couple of years and players went nuts ... so we brought it back. Best of all, the all new FLYweight (available on orders placed after September 2010) is even softer than the original, while maintaining all of the other performance benefits. 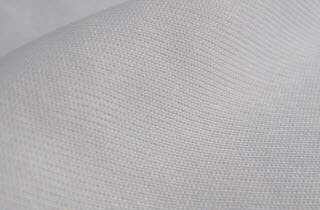 If you are looking for that classy silky touch and a sleek subtle shiny finish, SILKtouch is your fabric of choice. FLOtech - SILKtouch: is light and breathable, combining performance with a super silky smooth finish. Once you wear it you can't stop touching it as it feels so nice and soft. The silky finish also optimizes the clarity of sublimated art, graphics and numbers. Available for sublimation orders as well as for the new Solid SILK collection of 1-colour jerseys and shorts with screen printing. If you are looking for these extra stretchy free-feeling shorts, PROstretch is your fabric of choice. FLOtech - PROstretch: is a stretchy and comfy new performance fabric that is ideally suited for shorts and long sleeve jerseys. It has 8% Spandex* incorporated, a special yarn is used to weave the fabric and the weaving method and density of the yarn to each other have been optimized - all for a super nice and stretchy fabric. Simply great! The special composition makes the PROstretch smooth but still strong, straight falling but still light and keeps its shape for a long time. The PROstretch has an extemely soft touch and a subtle shiny finish. It complements perfectly well with jerseys made from our SILKtouch fabric. Available for sublimation orders (light coloured print recommended) as well as for the new Solid PRO collection of 1-colour shorts. 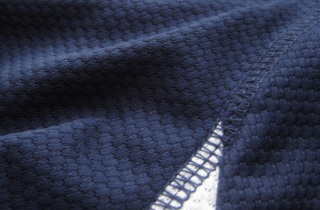 The percentage of Spandex in the fabric is only one of many factors that determine how stretchy the fabric can be. The other factors include: the type of yarn that was used to weave the fabric, the weaving method, how dense the yarn are to each other ... etc. More Spandex means more weight, less breathability and more bulging when used intensely over the time. 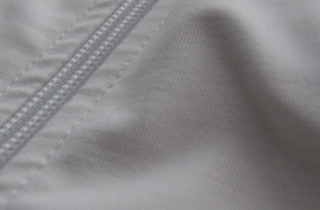 FLOtech - HEAVYweight: is a great team uniform fabric recommended for our full or no zip warm ups. It is a heavy weight, wicking, breathable fabric that will keep you warm before and after playing. It still surprises us why more teams don't take the chance to get a fully customized, warm up jacket and/or pants with their team name, logo, player names and numbers. 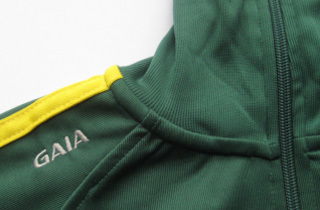 You live in your team uniforms so it only makes sense to get these affordable warm up items. FLOtech - FLOstretch: is 4 way stretch training, 'yoga type' fabric with a soft hand, a subtle shine and excellent durability. It is recommended for our 1/4 or full zip warm up tops or no-zip bottoms. FLOstretch fabric does not pull or pill. Stretch warm up pieces make the perfect second layer piece for training, team uniforms or as an official merchandise item at your next ultimate event.